Like boxes of photos and stacks of albums that can crowd closets and dominate bookshelves, digital photos can find themselves in all sorts of places. With the advances in camera technology, you are able to shoot more pictures with more speed and greater efficiency on not only your digital camera but also on your smartphone or tablet computer. This may help you capture more memories, advance your photography skills, and improve your photo editing knowledge but it can also create a photo collection that can quickly become disorganized. This is where photo album software like MAGIX Photo Manager Deluxe comes in as a helpful tool to help you declutter and get organized. The virtual world of your images may be easier to clean up compared to physical photos, but digital photos can still get lost when you have too many making it hard to organize. MAGIX Photo Manager Deluxe is the perfect photo album software to help you navigate through the complicated web of files and folders on your computer devoted to the various events or random uploads capturing your favorite memories. Whether you have yet to start your digital collection or have been assembling it for years, this user-friendly program can help you stay in control and manage photos. With features like facial recognition, duplicate picture location, and a system of bookmarks, this photo software is creates the ultimate photo album so that your photos are easy to find and always just a few clicks away. 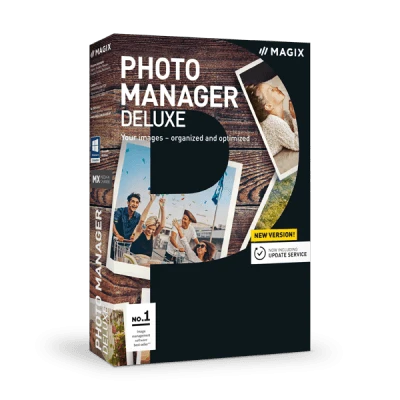 Not only is MAGIX Photo Manager Deluxe great for creating your digital photo album but it also allows you to edit your photos with its image optimization functions and create your very own photo slideshows. What’s even more special is that no edit is ever final, you can always go back and reverse what you have done. With the ease and simplicity of MAGIX Photo Manager Deluxe, it is the perfect photo album softwareto help both new and experienced photographers stay organized, edit photos and create stunning slideshows. The software is easy-to-use, flexible and customizable. Take the ease out of organizing and let this software organize your digital photo album.